Detroit Auto Show Swag Watch: Would You Like a Little Tea With Your Chinese Automobile? 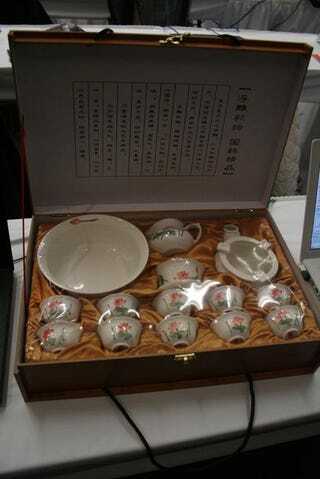 Geely was gracious enough to give the gift of a tea set to the attendees of its press event this afternoon. I began by raising a brow at the odd selection of swag, but the excitement across the faces of the hordes and hordes of journalists was enough to lower my brows and bring a big and bright smile to my face. No, no, no. Tonight the Jalopnik team won't be chugging beers, but rather having a dainty tea party discussing current events. Thanks, Geely!